In these days, the UK and the Mullahs that are close friends but pretend that they are enemy of each other, try to play new games for deceiving the stupid people. Their stupid games and their current stupid shows are really worthless and stupid, and we didn’t want to write about it, but what has happened behind the scenes is interesting. In these days, many shameful but important scandals, like the secret meetings between the Mullah Mafia and the western authorities some days after the Mullah Coup, or secret meetings between British Defence Minister and the Mullahs some days before the Mullah Militray Coup in 2009, or the stories of the Mullah Mafia and the Mullah embezzlers who live in the west, have disgraced the fake enemies, and they think they need new games to deceive public opinion. But the new games between the Mullahs and the UK are like a very stupid comedy. 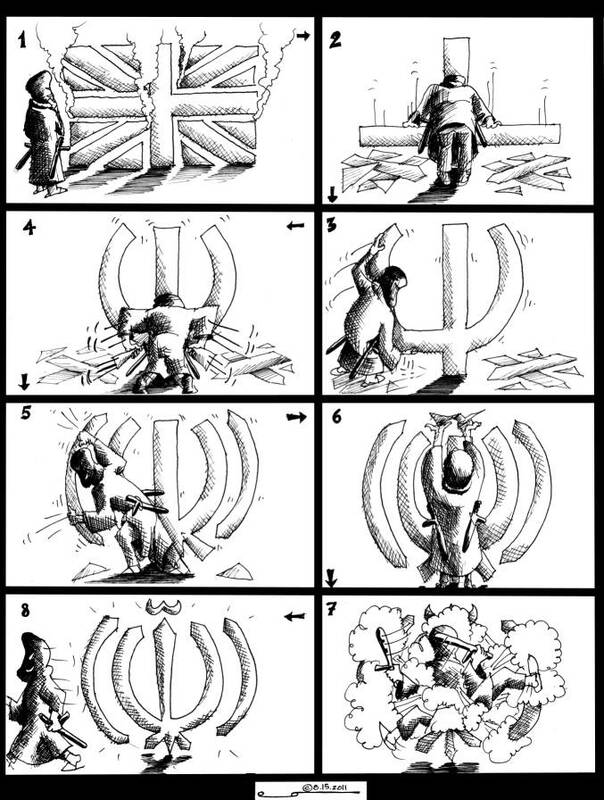 Many Iranians believe: “Their current game is another stupid game between the Mullahs and the British Mullah Makers”. So, lets take a look at a fictional story about this stupid game. What you read here is a fictional story about behind the scenes, but many believe it’s based on a true story. Robin: “Don’t worry. The foreign journalists in Tehran have learned their lessons” Haji: “OK. Can we destroy something inside the embassy?” Robin: “No, just break several windows and film it”. Haji: “OK. I want to ask our police to block the streets near the embassy. But I’m frightened that the foreign journalists report the truth and disgrace us.” Robin: “No, the foreign journalists in Tehran only report what we ask them. They will not have any interview with the ordinary Iranians. They only work with you and your Basiji mercenaries. Even if they reported something stupid, we call edit the reports here. Don’t worry”. Haji: “OK. So, we can do whatever we want to do, and we can be sure that the foreign journalists are like our Basiji reporters?” Robin: “Yah, they are like your Basiji mercenaries”. Haji: “OK. But Iranians will not accept our reports. They don’t watch our TV, and don’t read our newspapers. Of course I can contact our Iranian mercenaries in London and Washington, but how do you want to manipulate Iranians?” Robin: “Don’t worry. I will ask the BBC Persian and our Iranian mercenaries in the Iranian media to handle the situation. They are like your Mullah TV and your Mullah newspapers.” Haji: “OK. So, everything is ready for our show” Robin: “Yah, I wait for your show”. You are currently browsing the News About Iran blog archives for the day Wednesday, November 30th, 2011.